Freedom Party of Ontario was founded on January 1, 1984. From 1984 until 1993, Freedom Party members drafted a number of “Issue Papers” so that people would understand the party’s position on a wide number of – in some cases, philosophically abstract – issues. Freedom Party resumed issuance of Issue Papers beginning in or about February of 2014. These papers reflect the views of the people who authored them, when they authored them. 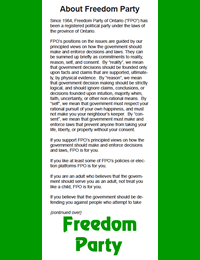 They are not necessarily a statement of Freedom Party of Ontario’s current and official views on any subject. Indeed, the party’s philosophy and message has continued to evolve and change since these Issue Papers were created.